Mother Nature and I played a fun game of “Chase” this morning. Literally!. It was cloudy when I started out. About a mile in, I noticed some looming and very dark clouds in the distance. Immediately, I measured their direction and distance in relation to the course I had set for myself. Seeing that I had a chance, the race was on!! A short while later, I began running through mildly gusty winds that often precede a storm. Soon I caught the faint, but familiar, smell of rain. I looked to the skies, but was unable to determine if it was anywhere near. I soon reached the point of no return. I could turn right and go the full distance of today’s planned run. Or I could turn around and take a series of shortcuts leading me back home quickly (and dry). I debated about which path to take. Actually, that internal argument went something like this. “Dude! Don’t go wimping out on me now! Be a MAN!! GO for it!!! !” It seemed like pretty sound logic at the moment. So, being fully armed with endorphins, adrenaline, and ego, I queued up high energy, beat pounding music on the iPod and turned right! To be honest, I sort of dig moments like this when focus and commitment seem to make everything else disappear. Even when the whole thing is seemingly trivial or made up. I pressed on through the next few miles ignoring the cars on the road that had their windshield wipers on. In the last half mile, I started to feel an occasional splash of tiny rain drops here and there. The resulting surge led me across today’s finish line dry and in record time!! Mother Nature and I have played this game a good many times. I have won a few and gotten soaked a few times. (I really should start keeping score!) Either way, I always have great time!!! I hope She feels the same way! Just passing the 60 mile mark! I got to run along the beach and some of the trails at the Santa Fe Dam Recreation Area. 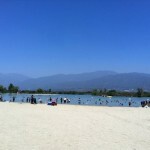 This part of the park afforded a grand view of the San Gabriel Mountains. The A2B Route led me straight down East Arrow Highway to the intersection at North Barranca Avenue in Glendora. Note: In the coming days, I will be making a few changes to the A2B Route. It will shift towards Las Vegas and The Grand Canyon. From there it will turn northward to Salt Lake City before going eastward to meet my up with my sister in Denver. It will add a few miles to the A2B Journey. However, it will offer the opportunity for more run by’s. Also, I hope it will encourage you and others to participate with me. Would you like A2B to pass by your house, business, or some interesting site? If possible, I could to run by and catch some high fives!! Better yet, why don’t you run with me for a while? I would love the company!! Several have already offered to run with me as I pass through their cities and counties. Please let me know your thoughts on this or any other part of A2B. You can leave a comment here. Or you can drop a line on Facebook at http://www.facebook.com/A2BRun. “Like” A2B while you’re there. Today, you ran right by the place where I first met my beloved husband: the corner of Irwindale Avenue and Arrow Highway. Ah, those were the days. And for the Sport Beans: “San Dimas High School football RULES!! !” -Bill and Ted. As always, keep up the great pace and the great job! You are an inspiration!